Anyway. Awesome piece today from the NYTimes. Would you believe that the US gets 10% of it's electricity from salvaged nuclear bomb material? That's more than triple the COMBINED contribution of solar, biomass, wind and geothermal. It's pretty interesting that anti-nuclear activists and utilities might have the same interest in ongoing nuclear disarmament. "In the last two decades, nuclear disarmament has become an integral part of the electricity industry, little known to most Americans. 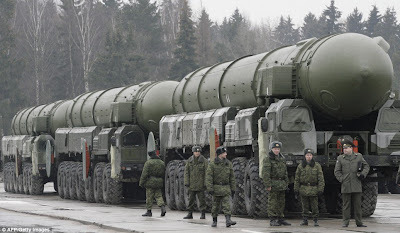 "Utilities have been loath to publicize the Russian bomb supply line for fear of spooking consumers: the fuel from missiles that may have once been aimed at your home may now be lighting it." They're not kidding about utilities being "loath to publicize" this information. 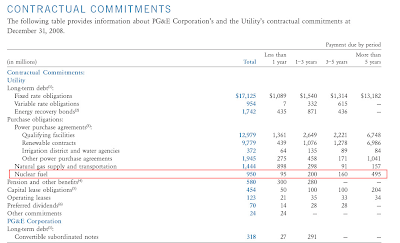 Pacific Gas & Electric, in their 10k, directs you to the ominous "Note 17" attached to their annual report. And what disclosure is there? Ah, they are "large, well-established international producers!" Well, I am no lawyer, so I'm not sure what level of disclosure is needed. But this isn't something to be upset about by any means. PG&E's "owned" generation (as opposed to purchased from others) is about 30% nuclear, located at its San Luis Obispo facility, detailed below.